The Rajasthan Institute of Engineering & Technology observed the vigilance awareness week from 29th October to 3rd November 2018. 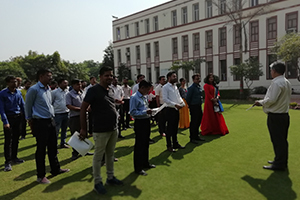 On 27th October all the HODs along with faculty members, the Principal RIET Dr Saroj Hiranwal, Dean Academics & Admin, RIET, Prof. Kapil Dev Sharma, and vice Principal RIET Dr Sachin Sharma, took the pledge to keep up the vigilance awareness. 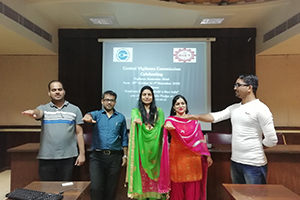 Speaking on the occasion Principal RIET Dr Saroj Hiranwal said that the Central Vigilance Commission, as part of its efforts to promote probity in public life and to achieve a corruption free society, observes Vigilance Awareness Week every year. The week in which 31st October, the birthday of late Sardar Vallabhbhai Patel falls is observed as Vigilance Awareness Week. The observance of Vigilance Awareness Week renews our commitment to achieve the goals of promoting integrity, transparency and accountability in public life. The Commission, therefore, lays greater emphasis on generation of awareness among the public as a more effective and sustainable means of fighting corruption. 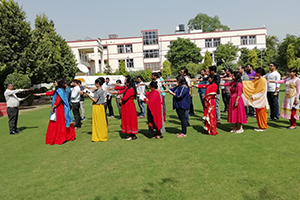 The pledge was recited by all faculty members following Dean Academics & Admin, RIET, Prof. Kapil Dev Sharma. “I believe that corruption has been one of the major obstacles to the economic, political and social progress of our country. I believe that all stakeholders, such as the government, citizens and the private sector, need to work together to eradicate corruption. I realize that every citizen should be vigilant and commit to the highest standards of honesty and integrity at all times and supports the fight against corruption. To follow probity and the rule of law in all walks of life. To neither take nor offer a bribe. To perform all tasks in an honest and transparent manner. To act in the public interest. To lead by example, exhibiting integrity in personal behaviour. To report any incident of corruption to the appropriate agency. The solemn ceremony was observed by all in RIET, with the promise to follow its words to the best of one’s ability.